An artist concept of NASA's Voyager 1 spacecraft leaving the solar system to enter interstellar space. NASA's Voyager 1 and Voyager 2 spacecraft are still going strong after nearly 37 years in space. "Both spacecraft are still operating, still very healthy. I guess as healthy as we are at the table right now," Suzanne Dodd, the Voyager project manager at NASA's Jet Propulsion Laboratory (JPL) said, drawing a big laugh from the audience at the SpaceFest VI conference in Pasadena, California, on May 11. Stone and Kohlhase recalled their astonishment when an image showing two exploding volcanoes on Jupiter's moon Io came into JPL late on a Friday afternoon in March 1979. The plumes went hundreds of miles above the surface, and the fallout covered an area the size of France. "We had what I call a terracentric view, which was based on understanding Earth," Stone said. "Before Voyager, the only known active volcanoes in the solar system were on Earth. Then we flew by Io, a little moon about the size of our moon, with 10 times the volcanic activity of Earth. And suddenly our terracentric extrapolation just was falling way short, and that was happening time after time after time. "It was an incredible time where every day there were so many things we were discovering that we just moved on to the next one," Stone added. "If we didn't understand what we were seeing right away, we said, all right, let's wait 'til tomorrow to see what else we get." Suzanne Dodd, Voyager project manager, NASA's Jet Propulsion Lab (JPL) holds a replica of the golden record carried on Voyager at a news conference on NASA's Voyager 1 spacecraft, Thursday, Sept. 12, 2013 at NASA Headquarters in Washington. The Voyager missions also forever changed the way spacecraft were built and operated. Before the spacecraft were launched, Kohlhase had the job of sorting through some 10,000 trajectories for projected launch windows in 1976 through 1978. He used computers to determine which ones would allow the spacecraft to make the best approaches to Jupiter, Saturn and their moons. Kohlhase and the scientists settled on 110 trajectories and ultimately used two of them. Dodd says the Voyager mission continues to throw up challenges today. The spacecraft have 20-watt transmitters – the equivalent of a refrigerator light bulb – and signals are only 1 billionth of a billionth of a watt in strength by the time they reach Earth. JPL uses the powerful antennas of the Deep Space Network to communicate with the distant spacecraft. "The engineering challenges are extremely unique to Voyager," Dodd said. "You're operating instruments below temperatures that we can't even measure. Challenges of finding out if we turn on a component that's next to a hydrazine line, would that hydrazine line freeze or not. We don't know. "Another unique challenge to it is that the engineers who built this are retired, some have passed away, you need to get people like Charley out of retirement to come and talk to us," Dodd added. "It's a challenge engineering-wise, it's a challenge from a knowledge standpoint of what people know. And that's what makes this project fun." 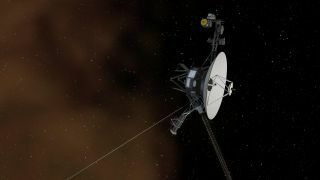 The Voyagers still have a lot of life left in them even after nearly four decades on space. "Looking forward, we expect to get 10 more years of scientific data out of the Voyager spacecraft," Dodd said. "We basically turned off everything we can turn off to save power. Backup heaters are off, backup systems are off. We're having some serious discussions about how to move forward, because we're almost down to the scientific instruments now." After that, the spacecraft could continue on for another five to seven years sending engineering signals to Earth. Engineers are already in discussions with the Deep Space Network about what experiments could be conducted with those signals before the spacecraft fall silent.